There has been much talk around the Digital Workplace and how best to define it. Digital transformation moves so quickly, that you could redefine it on a daily basis. But what does it mean to us? We believe the answer lies not just in technology, but in the attitudes and ideas of an organisation. Although innovation is important, you also need agility, flexibility and mobility. The world of business is becoming more global, requiring enhanced 24/7 connectivity. Although this brings many advantages to your organisation and employees, it also creates several problems, particularly from a security perspective, with multiple different systems and personal devices being used to access your company network as you embrace new ways of working such as BYOD. The world of work is changing to a truly global business model. Companies who do not evolve towards a digital workplace will struggle for survival in a world where success is driven by a combination of people, process and technology. Within this ‘Digital Workplace’ Ricoh has identified several key areas within our portfolio that we believe will help companies overcome all manner of existing challenges to become truly digital, globally. Some of these offerings are cloud based, catering to the increasing requirement of mobility and could also help to reduce IT workload and decrease environmental impact. To us the challenges surrounding digital workplaces are not limited to any one company or industry. All organisations want satisfied customers, engaged employees and increased profits. At the same time, security and efficient global operations are also seen as priorities. 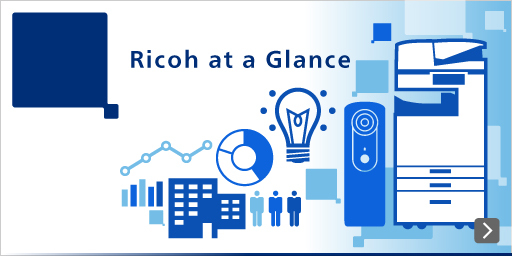 At Ricoh we are dealing with the same issues, which is why we feel well-placed to help your organisation solve these challenges. Ricoh can provide both local and global account management support. We focus on fully integrated, end-to-end solutions – not just hardware. We strive to create long-term collaborative partnerships with our customers, helping you to work smarter. We seek constant improvement, co-innovating and co-creating with our customers to create real, practical ideas that will transform the workplace and deliver the best experience for you and your customers. Ricoh Global Services provides extensive global and local management and support through our network of direct sales and support channels, employing more than 30,000 service delivery professionals across 200 countries and territories. To ensure a consistent approach, we will assign you a Single Point of Contact who will be responsible for all of your queries. Who are Ricoh Global Services? In addition to our global reach and consistent support, Ricoh Global Services can provide your organization with professional services which are optimized to your industry and customers based on our extensive knowledge and experience. Ricoh Global Services provides consulting, strategic support and long-term partnerships to our customers. Our extensive market expertise means that we’re familiar with the challenges faced by some of the most complex industries on the planet. The Ricoh Global Account team is here for central coordination, offering a global governance structure that provides a consistent global service for organizations that operate across multiple countries or territories. An adaptive approach to service engagements that focuses on continuous improvement. A solid understanding of local markets and cultures.